Edited by Alastair Phillips & Ginette Vincendeau. 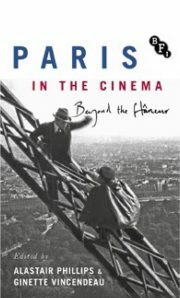 This is a compelling selection of stimulating essays for all lovers of Paris and French cinema. The editors have invited a selection of international experts to produce a wide range of critical analyses of French films where Paris stars as a leading character. Vincendeau is Professor in Film Studies at King’s College and Chevalier de l’Ordre des Arts et des Lettres. Phillips, an editor of Screen magazine, is also Associate Professor in Film Studies at the University of Warwick. Their dynamic collection is attractive and engaging. These editors remind us that ‘Paris remains one of the most iconic, filmed cities in the world’ but they challenge the location as being merely a visual backdrop of glamour and romance. The essays often take a socio-political views of French cinematic narratives and imagery as they examine politics, urban geography and memory. Most pleasing is the challenging of Parisian stereotypes. The book’s subtitle Beyond the flâneur makes it clear that the aim of the authors is to deconstruct the cliché of the flâneur as an existential figure, nearly always male, walking through the Paris street. In each essay the interface between character, narrative drive and urban geography is inflected with a socio-political analysis. The flâneur is a poetic invention wandering through the streets dominated by Haussman’s nineteenth century architecture. It is the décor supporting the archetype of the flâneur who is nearly always male. Many critics have seen a flâneuse in the character of Cléo in Agnes Varda’s 1962 movie Cléo de 5 à 7. However Jennifer Wallace challenges this. She sharply examines Varda’s Cléo as an existentialist heroine whose journeys through Paris are the outward manifestation of an inner journey. Cléo, a famous pop star, moves away from the vanity of her artificially constructed public appearance and materialistic vapid relationships with men to a nuanced connection with the city and a man she meets by chance. In the 90 minutes of the film, the character awaits the possibility of a cancer diagnosis and this is the hidden time bomb of the scenario. However the terror of the diagnosis is mitigated by Cléo’s healing journey through Paris. Wallace points to how Varda achieves character development through Cléo’s awareness of snatched conversations, the abandonment of conventional constructions of Parisian femininity and the spontaneity of living in the moment. The drama is elliptical and if Cléo is the protagonist then Paris is a redemptive antagonist. The arc of the screenplay is one of gentle discovery. For Varda, the Paris cityscape is an extension of an inner psychic territory. Cléo, and her friend Dorothée, take public transport. The way Varda shoots this, roots the two women in the atmosphere of the noisy Paris street and gives them agency as active individuals who are keenly aware of those around them. Neither the women nor Paris are glamorised. Wallace’s examination of Cléo de 5 à 7 allows us to explore Varda’s achievement as a major but neglected work of the New Wave. The deconstruction of stereotypes is not limited to that of the flâneur. Raphaëlle Moine’s The Concierge in Contemporary French Cinema offers the caretaker as a symbol of working class Paris where the female gatekeeper expresses the social changes of the physical and human architecture of the city. Stephen Gundle’s The Enduring Glamour of the Parisienne explains how Paris itself is incarnated in the fantasy of sophisticated Parisian womanhood particularly as epitomised in the actor Catherine Deneuve. He reveals how the image of Deneuve has subtly transformed over the decades as French society itself has become more open to women’s narratives as independent Parisians with nuanced and complex characters. in The Parisian Banlieue on Screen: So Close, Yet So far Vincendeau examines the Other Paris, that of the suburbs beyond the ring road. This is the Paris of the poor who inhabit the zones of the high-rise. Vincendeau illustrates how cinéastes have variously explored the endemic tension between ‘Paris’ and the suburbs pointing out how the tension between the two locations, and populations, express class war. She critique the French media for exacerbating social tensions by either ignoring deprived populations or reducing them to ‘a narrow band of alienated young men’ epitomised by the protagonists of Mathieu Kassowitz’s 1995 film La Haine. This essay does not confine itself only to the cinema of the banlieue it also explores the influence of the socio-economic-cultural philosophy which influences the material production of films set in the periphery. Vincendeau notes that suburban municipalities often contribute to the financing of local shoots. Films which present positive images of the banlieue can boost local economy and even push up house prices. In this way local geography can be re-visualised as a place worthy of artistic attention and political invigoration. Vincendeau helps the English reader to understand the liaison between local French politics and the political resonances of cinema through film production at all levels. It is another Paris that Sandy Flitterman-Lewis evokes in Site of Infamy: The Vel’ d’Hiv in French Cinema. This enormous velodrome was destroyed in 1959 perhaps because it was the memory site of one of the most shameful events in French history: La Rafle- the Round Up of the Jews. This terrible event took place on 16-17 July 1942 and was conducted by the French gendarmerie as it obsequiously served the Nazi death machine. Flitterman-Lewis notes that ‘Post-war orders to destroy all records of the roundup enacted a policy of organised amnesia’. In 70 years only five feature films have alluded to this murderous act. Flitterman-Lewis’ chapter discusses three. Les Guichets du Louvre, Monsieur Klein and La Rafle. She gives us a strong interpretation of how Paris figures in a shameful French history but I am not sure that any French auteur has yet explored the narrative of the betrayal of Jews in France from the inside. I have not done justice to all the expert contributors to this compact and dense volume but, by examining a few, I hope to give a sense of how important this collection is to anyone interested in cinematic representations of Paris and France. Vincendeau and Phillips have produced a seminal work which doubles as a leading reference and an accessible entry point for those of us who enjoy learning how to read French cinema as the reflection of a complex and troubling society that, at its best, succeeds in challenging clichés and uncovering taboos. London Grip Poetry Review – Phil Kirby	Rodin and the art of ancient Greece. Review by Julia Pascal.